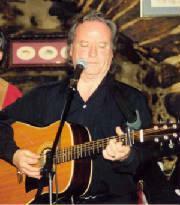 Beggars Row were first formed in 1997 especially for the Culross Festival by Bob Ferguson, disbanded later that year. In 1998 Bob and Ian Raymond reformed Beggars Row with a new line up. By the summer of that year the Beggars went to Russia with overwhelming success and three more tours followed. The last one involved twenty three concerts in twenty one days as well as TV shows and several press conferences. Since then there have been some personnel changes though Bob, Gus and David remain from the original line up as founder members. Early in 2000 Neil joined and has become the anchor on stage as the rest of the band roam around on and off stage as part of a highly energetic performance. The act continued to develop into more of a show during further tours of Russia,Norway, Holland, Denmark, Belgium and Ireland. 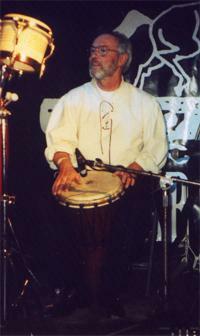 By the time Ricky joined as percussionist Beggars Row were selling out at Concerts and Festivals and building a fiercely loyal fan base. Many of the Beggars Row fans travel hundreds of miles to see the band playing. Frank had been with Beggars Row from the early days and had toured with Beggars Row on their early Russian and European tours. Frank was very colourful in his tartan stagewear like Bob and Gus but increasing demands on his talents made it impossible for him to commit full time to Beggars Row and he departed the band as a friend. Colin Finn was one of the highly successful members of the JSD band who actually were in the charts with their Celtic instrumental hit Jig a Jig. When he joined Beggars Row he brought a great deal of experience with him and was a huge influence on all the arrangements of our songs and tunes. Sometimes nicknamed Smiler! he was always a happy character on and off stage and fitted in perfectly with the happy go lucky style of the band. LIke all bands turnover of members seems a fact of life. 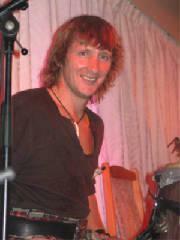 Ian Raymond who had toured extensively with the Beggars from the start of the reformed line up had to leave. Ian worked in a job that made it very difficult to get time off . He could have left his job but that would have meant losing out on a very good pension deal as he was only three years away from early retirement. He made the wise decision to protect his future and Beggars Row were down to 5 musicians. The problem in trying to replace Ian Raymond was that he had such an immensely good deep ballad voice that we could see no one capable of replacing him, so we did'nt try. Colin Finn also ran a highly successful musical instrument shop in the vilage in East Kilbride Scotland. As the business grew and Colin also had to spend more and more time on his new music tuition school the inevitable happened. Colin had no time left to tour and so Beggars Row were loking for another pwecussionist. The big problem was finding someone who could replace the two Beggars Row legends. Ricky Murray joins Beggars Row. When Colin left we had a hard act to follow in finding a replacement but eventually we did. Ricky brought a lot of energy and experience from his other previous bands and had the other ingredient required by Beggars Row! he was as crazy as the rest of the band. Now when The Beggars are playing they are often always billed as the best live Celtic Band from Scotland. We hope that in ten or twenty years from now this Biography will be a lot longer and our friendship and music will still be playing for you for a lot longer than one can imagine. We would like to express or gratitude to Bent & Peter from Art and Music in Denmark for their continued faith in Beggars Row by continuing to secure prestigious venues for us in Denmark. We are proud to be represented by Art and Music who also represent Fairport Convention, Ralph McTell, Magna Carta and other greats in the Folk Music world. In 2005 Gus regretably left Beggars Row and it was a sad day for all of us. From the early days Gus had been highly influential in how Beggars Row were to develop their style and stage show. Gus could have left before but tried desperately to hang on in there like a true professional, but in the end for the sake of his health he had to leave. In 2005 after Gus left Beggars Row Farquhar McDonald from the Isle of Skye joined as replacement. Farquhar had previously played for Beggars Row in Holland as deputy for Gus when he was ill for a tour. Farquhar brings his own crazy style to the band including going off stage with the rest of us into the audience with his fiddle. An added feature of having Farquhar in the Beggars is that like David he also plays the Great Highland Bagpipes and accompanies David on his walk abouts in the audience to help create an even more spectacular show.